Review of the Year - 24 Pints Quota Reached! The last pint of the year tasted mighty sweet! This was a toss up between my victory in the Peg Race yesterday and the achievement of breaking the 4hour mark in the Dublin City Marathon by posting a time of 3.43... the nod has to go to my marathon achievement! Without doubt the Craughwell 10 miler. This should be renamed the CraughUNwell 10 miler. I ran the entire race while while suffering achy and fluey bones. I had hoped that the flu feeling would leave the minute I started running, but the more I tried the up my stride the worse it got. This was my first year blogging and I enjoyed it more as the year went on. The best thing about blogging is the fact that you can drop in on other bloggers that interest you and leave comments or just read up. All my favourites are listed on the left of this site, but for one in particular I must mention the legendary Old Running Fox - the gong for best blog of 2010 must go to this inspirational runner! The benefit of not drinking any more that 24 pints in a year is that I remember them all, as opposed to forgetting them all the next day! My favourite has to be that first one that was savoured outside The Saltee Pub following the Annacurra Run back in February! Juneathon for sure... and hats off to all who organised and participated in the marathon blog fest that was Juneathon (when I had to run and blog every day in June). A similar idea will go ahead for January (Janathon), though I think I'll sit this one out and wait for next June again! 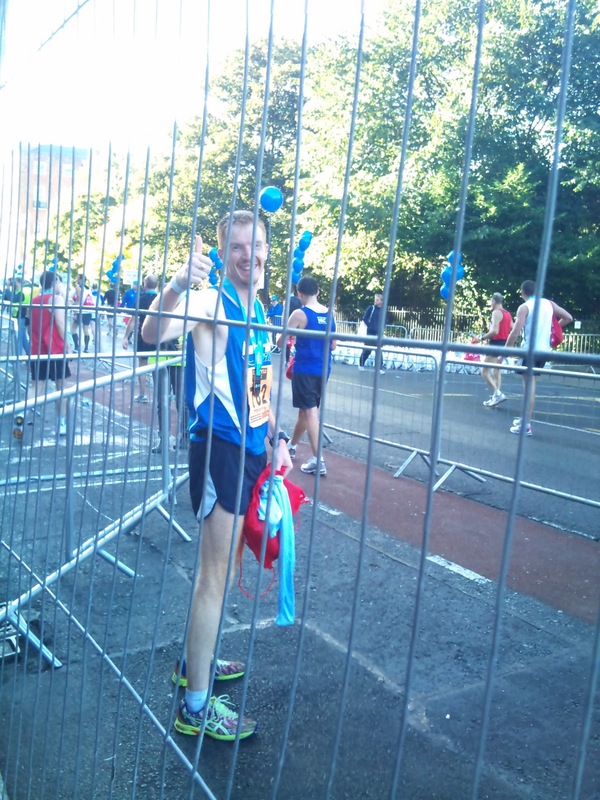 Last award goes to good friend Big Ron, who sailed through the year with no beer whatsoever and set a fantastic marathon time in Dublin, posting an amazing 3.15. How much faster can this man go? Run more, drink a little more, keep the blog going, enjoy life. More detailed goals may be set out in the coming days! After years of participating lamely, I finally won the Peg Race today, in a what proved to be an epic race, led for the most part by Catriona Carroll! Caitríona makes a serious break for it at the midway point. Post race pose... all eyes on next year again! The first of the Christmas Pegs have been collected, though by default! I was the only one left not complaining of flu, bad back, dodgy hip, hangover or overwhelming responsibility. So, to keep the tradition alive I got out and ran five miles all by my lonesome! The snow was still heavy on the ground and the temperature well down, but it was one of the nicest runs I've had for some time. The countryside was covered in a brilliant white coat of snow and once my lungs got to adjust to the sharpness of the air it was absolutely lovely. Stephen's Day in County Louth with the in-laws is always a nice and relaxing time, and so-far this year there has been no excess for me - so I found the run to be very enjoyable. At one point I left the road and ran into a corn field, which of course was covered in snow. I kept to the perimeter of what must have been two football fields in area and then started panicking that some farmer might come out with his gun (I noticed a sign for 'Stabannon Gun Club')! I still haven't drank any of my last four pints for the year... perhaps one or two tonight! Eyes on the Peg Now. Peg '08, at an early, and extremely uncompetitive stage. I didn't run that year due to a bout of flu brought on by 'over indulgence' the night before... a problem I won't have this year! It all comes down to this... The sweat, strain, strange diet and sleepless nights were all for Peg. For six years now Christmas in Conamara has meant one thing only: a race to avoid humiliation, a gathering of the unfit to do fit things, a call to reach above ourselves between the beer and the turkey. A call to Peg. 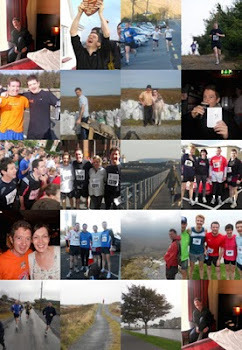 Yes, the Peg Run, now entering it's seventh year has seen but a few winners: the ever youthful Richie, the ever injured Mícheál (winning on one knee), the surprising surge of LMD and, of course, the Con Man. Never have I won - but this year, as always, I dream... Our international field includes Boston's greatest redneck, Mur T-Party Donnell, Scotland's Michael 'Kilt' Casey and hopefully a special guest competitor from Cologne this year, Jorn. Senior citizens will be represented by Kevin 'Joycian Rambler' O Hara, and Mark 'Twin Peaks' O Connell. The Carroll ladies have also signed up, and of course the youthful dash of Conán and Fionn could still upset the odds. A date has yet to be announced, although Cormac 'One-Mile-Dash' O hEadhra, has introduced a 'late debate' as to the length of the run....? I, for one, feel we should keep the old 3.5mile route. And of course, I will continue to spread the gospel of the Peg by also running a leg of the peg in the wee county....! I stood with 13,000 other demented souls on a cold October morning in Dublin and waited for Loudspeaker Man to call us off. Marathon morning is full of anxiety - when to get up, what to eat, when to eat, how much to eat! Hardly anyone does the same thing - in our hotel there were runners eating eggs, some eating cereal, some porridge, some drinking tons of water and others downing coffee. Viv was up at 5am - couldn't sleep so he got up and ate his breakfast at an ungodly hour. I spent the night tossing and turning - I didn't think I was anxious, but I clearly was! At the start line, however, with the 13,000 others, I felt ready for the challenge. Loudspeaker Man did the honours and away we went like hens released from a coup! My plan was to start off nice and slowly, find a rhythm, and break the run into segments of three miles. Rónán was tagging the 3.15 group and Viv was going to play it by ear - having only begun his training 12 weeks ago. Conor, the marathon giant among us, was adding another to his relentless march towards 100. I had trained without a watch, so I was not quite sure of what time to expect, but I hoped to be under four hours- slightly! After three miles I had established a comfortable pace, taking advice from wise owls like the great running fox and Conor, I took it nice and easy at the start. I noticed that I was within about 800 metres of the 3.45 pace group (they were carrying a big purple balloon, so - hard to miss!) so I decided to keep this group within my site for a while. Miles 6-9 were fine, with the first real hill coming at the nine mile mark. All the training I had done on Seanadh Phéistín's hills came in handy here as I tore up this incline, passing a heap of runners and feeling great. At this stage I was sure I could keep that purple balloon in my site and set a good time. Miles 9-12 dragged a bit, but the purple balloon didn't get too far ahead yet! I somehow felt the next three-mile segment, between 12-15 would be the toughest and, for me, it proved to be just that. The crowds along the way were great -handing out all kinds of jellies and treats and pushing us all on. With their help and a bit of inner dog I got through this rough period and came out at mile 15 feeling a bit weary, but encouraged that I was beginning to improve again. Miles 15-18 were significant for me, in that they contained another few inclines where I could push on up. I reached mile 18 in good nick, with the purple balloon the same distance ahead of me as it had been since the start of the race. Now I had a cunning plan! The first part of the plan was to spend miles 18-21 very slowly reeling in the 3.45 pace group and their purple balloon! I was aided by the marathon's toughest incline at mile 19, where once again I felt the benefit of Seanadh Phéistín. I actually caught the purple balloon group at the midway point of mile 20 but decided to stay with them until we came to the 21 mark. At that point came part two of my plan! I was determined now to exert myself as much as I could between miles 21-24, knowing that I could open a gap on the purple balloon group in order to ensure that, even if I crawled the last two miles I would still make the line under 3.45 (an astonishing time for me!). I opened a good gap for sure, and may have started to fade at around the 23 mile mark, but still kept a fair pace going. The last mile of the marathon was especially difficult - having nearly emptied the tank earlier. As we came by Trinity College the crowd were yelling 'just around the corner now'! However, turning the corner didn't reveal the finish line so my heart sank for a few moments... and then.... THERE IT WAS AFTER TWENTY SIX MILES - THE FINISH!!! I hobbled towards the end, spotted my lovely wife cheering in the crowd and saw that the clock said 3.44. As it turns out, I ran an official time of 3.43.57 (taking chip time into account). I was absolutely delighted - I never thought I would get near this time! Rónán crossed the line in an astonishing 3 hours and 15 minutes, Conor chalked up his gazillionth marathon in 3.28 and Viv pushed his Banner snout over the line in 3.59. Later that night I drank my 19th and 20th pints of the year and the previous evening I celebrated my 36th birthday. 3 Miles, Contemplating Marathon Strategy. The sun going down on Galway Bay! This pic may be the last taken by my Nikon camera, for she did start playing up afterwards (lens not opening). This evening I ran three miles of prime October chill. It was so cold that I noticed a flock of seagulls doing star jumps on Blackrock pier, just to stay warm. And truthfully it was so cold that I wore a thermal vest for the first time ever (and will consider running in Long Johns if these arctic conditions continue). However, the weather may be cold, but it's also strangely glorious - and bright as Summer. What preoccupied my mind during tonight's trot was: what will my marathon strategy be? I would love to come in under four hours, but I fluctuate between being confident of doing that, and being doubtful that I can actually finish the distance. The doubts creep in whenever I consider the following scenario: I go out too fast in an attempt to stick with the 3.45hr group and fall apart at mile 16. However, the alternative is that I go out too slowly and thus underachieve! Anyway, my latest thought is that I will do as I've done throughout my training regime: run as I feel, care not at all about finishing times, start easy and see how it goes. After all, I would be happier to finish the marathon well rather than have it finish me! 6 on Friday, 8 Today. On my way out to Salthill for Friday's six mile tempo run I snapped this tree on the Claddagh basin. The Dublin Marathon is but a week away and I'm well on my taper down now. D and I were away yesterday, so a bad diet of cake, coffee and a late night, coupled with a fair drive home, left me struggling with my eight mile run back at home this evening, but it went well enough, all considering. On Friday I ran my tempo six miler on the prom in Salthill - a lovely evening for running. So, I'm nearly there - hope to follow a schedule of good eating, drinking and sleeping this week, for I face a big, big run on Monday next. A view from the start of our Rosmuc run... unfortunately this is the best snap I could take before my camera batteries ran out! We gathered at a lay-by three miles east of Camus, pulling up our cars and warming up. There weren't many of us but this was a legitimately organised race, fair play to Róisín Ní Mhainín, who is collecting for Cancer Care West. The race itself was to head west towards Rosmuc (a six mile, flat run). The problem for both Rónán and I was that our schedule called for a 13mile training run, so we decided to run the race, then turn around at the finish line and head back towards our car (adding a further mile when we got there)! The pace was waaaaaaaay too fast for my marathon run - I would say that a good portion of the first six miles was run under 8 minutes! We did slow down on the way back though, and it was very nice to get a training run in with Rónán, prior to our big day in a few weeks time. By the way, Big Ron should be tested for drugs because he ran those first six miles at a sub 7 pace! For the first time since the depths of last winter I returned to the treadmill this evening to do my interval training. What a drag the treadmill is after months of open road! I wouldn't have gone near it had it not been for the darkness that descends on this area in the evenings, and due to my granduncle's funeral we were all late returning home. Still, the important thing is that the intervals are done: 10 minutes slow, 6 by 800mtrs, and 10 minutes warm down. Another step closer. Destination : An Spidéal - a lovely little village/town by the sea in Conamara which was the peak of my 20 mile run. I dreaded this run. It was a monster in my mind for the past week - every time I thought of it I pictured myself being stranded miles from the car with both legs shot to pieces, gasping for water and praying for someone I knew to pass and give me a lift back! Therefore, it was more than fantastic that it turned out to be a strong, confidence-building run. I decided to run the coast road to An Spidéal instead of my usual Seanadh Phéistín route. This is a busy, but extremely flat road, with only one or two slight inclines. I parked the car at the midway point and ran five miles west, returning to the car, then five miles east and back home! The first five were fine - I left a bottle of water at the turn but only took two small gulps. Here was my first turn, after five miles. I left a bottle of water here, another at the ten mile mark, and another at the 13 and 18 mile marks. I was happy enough with my water management - only took a few gulps each time, rather than my old style of carrying the bottles for ages! The next five weren't too bad either - actually it was going so well for me that I almost invented a problem of 'heavy-leggedness' just to offset my surprise at how good I felt! The five miles to Spiddal were the quickest of all - at this point I was well in the rhythm. On the turn from Spiddal I was buoyed by the fact that I was only five miles from home and feeling strong - there would be no shameful end to this day! At this point I considered my pace and felt it was strong enough (I don't wear a watch so had no idea what time I was registering). On returning to the car and checking the time I discovered that I had run the twenty miles in three hours - which is 9 minute miles on the nose. If I can manage this for the full marathon then the sub four is a definite possibility. However, there is a long way to go yet, and much can happen between now and October 25. BUT, for once I feel confident - I've reached the peak of the training programme, and if the taper goes well then there is no reason not to be upbeat... Also, my granduncle died last night - aged 92. He was a great old spirit, always happy despite living through hard enough times. A lot to learn from his likes, RIP. On my way out the Seanadh Phéistín road, a strange looking gull held up the car with an arrogant, imperious, mid-road walk! I was kicking myself that I didn't bring my digital camera - for this was a moment to catch! Another moment occurred at the end of the run - having returned to the car there were four beautiful Connemara ponies standing elegantly on the bog (I'm sure they were the same horses pictured above, a few months ago). One of them approached the car after I had sat in, so I rolled down the driver's window and fed him two pears - he was actually poking his lovely white head in through the window! In between all this there was the run: I started off downhill, and at a pace that I just couldn't maintain. Still, the pace throughout was brisk enough, with the exception of a stretch between miles 3-4 when I developed a slight stitch after my ridiculously quick start! I recovered from this though and finished the run well enough. Next up, an intimidating 20 miler! Given the hardship (some brought on by myself) of the past few runs, I can honestly say that today's interval session was a breeze. It called for a 10 min warm up, followed by 2mins fast by 5 times, with 2 mins easy in between. I decided to run this on the famous Salthill promenade, amid all the walkers, skaters, strollers and of course, fellow runners! The Difference in a Week. After my run D and I brought Conall and Andrew to the lovely Knockabbey Gardens. During last week's 18 miler I felt tired every time I ran a hill, struggled for most of my run and walked a lot of the last four miles. I was on a 'carb free' diet for two weeks, which was pure stupidity for long distance running (as pointed out by my fellow bloggers). Following this traumatic day I took the rest of the week off from running (which is also pure stupidity for anyone who is supposed to be training for a marathon at the end of October, but there you go, I'm pure stupid). This Friday Deirdre and I traveled up to Louth and I decided to break from this carb free programme. Well be the hokey, the minute I did my body went wild for all kinds of chocolates, fig rolls, biscuits of any description, chips, chinese take away - you name it! I had to eventually settle myself down on Saturday evening and say 'right lad, drink water, eat healthy and cop on to yourself'! I woke up early this morning, had a good breakfast, went to mass in Stabannon, and then out for a run. T'was a gorgeous day. I set no targets for myself, no barriers either - it could be four miles or seven, fast or slow, all depending on how I felt. And, believe or not, I felt great! The carbo-loading of the previous two days worked wonders as I trotted along at a decent pace, without any strain! I ended up running 13 miles - which was bang on my furman programme, and felt great afterwards. From now on I'm on the straight and narrow when it comes to training and nutrition - no funny stuff, plenty of carbs and follow through with all my training runs. It can be done! 18 miles, running and walking. The one plus I can take from yesterday's 18 miler is that I finished it, somehow. First the background story: a number of months ago I went to a nutritionist in order to get back running and to get rid of a constant feeling of fatigue. Since then I have been following a programme of cleanses (which have been excellent) that has culminated with a carb free few weeks - the theory here being that I was training the body to get the maximum nutrients from protein. It is not advisable to run long distance on such a programme, but with the Dublin marathon coming up I knew that I just had to get on with it... Once again the route was Seanadh Phéistín (correct spelling!). I parked the car at the midway point so that I could run 4.5 miles in one direction, then run back to the car, and then run 4.5miles in the other direction - and back to the car again! I had left my magic drink at various stages (drink contained chia seeds, synergy powder and Pink Himalayan salt). The first three miles were okay and then I hit a stretch of 1.5 miles uphill. I ran this steadily but had to stop briefly at the turn while I drank my magic. The next two miles were all down hill, I felt I was doing fine but the minute I hit an uphill stretch I had to stop and walk again! The week of no carbs or sugar had totally taken it's toll and left me without any energy to run the hills. However, I wasn't too concerned at this point - thinking that a 'run/walk' technique was good in the circumstances! The second half of the run turned nasty however. I had to stop to walk at miles 10 and 12 and then faced a 4.5 mile run to the finish that was mainly UPHILL! This stretch took an eternity to finish and I walked most of it. My legs were shot from all the stopping and starting and my head felt light whenever I tried the mildest trot. Logically I know that you can't run long distances and stay away from carbohydrates for a long period of time, however, I have very little time left until the Dublin marathon and one long run has been sacrificed. Also, the trauma of Monday puts me off going out again this week. Yikes. I decided, following my weak efforts last week, to take a few days off running this week. To be honest, I felt a bit 'run-downiness' so I thought the break might do me good. So I missed the intervals(repeats) part of my furman week, but picked up with a tempo session yesterday evening. The session called for six miles (1 mile easy, 4 miles pace and 1 mile easy). I definitely felt the same old tiredness at the start of the run, but thankfully I could trot along for a mile before picking up the pace. The first mile of tempo was all up hill and grand until I reached close to the top - at which point it was tough but still manageable. The next mile was a mix of downhill and flat so that was fine HOWEVER, just as I was about to hit the seriously hilly fourth tempo mile I got a very bad stitch down the right side of my body. At first I really wanted to run through this pain, for fear of making a habit of these stops (I had to stop twice last week), however, the stitch was so bad that it had slowed me down considerably so the 'tempo' was not really working out to well at this point! I took the decision to stop and walk for a short time to get rid of this stitch prior to taking on the hill at some pace. This worked out pretty well for me - I was up and running again well within a minute, stitch gone, and pace back. I had no problem from there to the end and actually made good time for the entire run. Things are still not ideal for me, and with an 18 miler up next the confidence needs a boost soon. It doesn't help that I'm on a carb free diet for the next few weeks due to this nutritional programme I'm following. On the plus side - I am only two savagely long runs away from beginning the taper for the Dublin Marathon - I can almost see the light! 13 Miles of Pure Slog. An old ruin in Seanféistín that marked the start of my woeful 13mile run today. After Friday's set back I'm happy just to have completed today's 13 miler, but I completed it only just. This was definitely a tough week for me running wise - I suffered through the intervals on Wednesday, failed my nine miler on Friday and only just got over the line today. I'm confused as to why I've stuttered this week - perhaps it's to do with being back to work and up earlier than ever (6.30am rises, not an ungodly hour)? Next week calls for an 18 mile run on Sunday, so I need a rapid recovery! Pace: Plodding along with jelly legs. Satisfaction: 3/10 - purely for the fact that I didn't give in this time. View of the Long Walk from The Claddagh. Hardy old daisies standing up to the might Atlantic! Today called for: 1k, 2k, 1k, 1k - at tempo pace, with 400m rest interval in between. This was my first interval run for some time so I felt it tough enough. I decided to face it down bit by bit, telling myself that 'If I get through the next 1k I'll think about stopping', and then 'If I can managed to do two more laps, I'll have earned the right to stop'... but knowing deep down that I woudn't quit. It was tough for sure, but I got through it and I'm still alive! Next up is my 9 mile tempo run on Friday. Looking forward to it...! 18th pint after 6 out of 12 pens. The spine of Binn Choirr as it turns on to Binn Dhubh, in the Twelve Pens Mountain Range. For the last hurrah of my holidays I climbed six of the twelve pens (Connemara's main mountain range) on a fine day yesterday, with Brendan McGowan. We set off early - meeting at Peacock's Pub in Maam Cross at 9.15am, and then drove the two cars past Recess village until we came to the Youth Hostel at the bottom of Ben Lettery Mountain. This would be the finishing point, so we dropped one car here and drove back 4 kms to where the climb would start. The plan then was to walk the Gleann Chócháin loop, which takes in the six 'pens' (peaks) called: Binn Dhoire Chláir, Binn Choirr, Binn Dhubh, Binn Bhrian, Binn Ghabhair and Binn Lettery. 'Binn', the Irish for 'Ben', is the old Irish word for 'Peak'. The day was perfect for walking - with the most important thing being that the underfoot conditions were perfectly dry. A pool of water at the top of Binn Choirr, in the distance you can see the last two peaks of the loop, Binn Ghabhair and Binn Leitrí. The first climb, up to Binn Dhoire Chláir (or Derryclare), was nearly the most difficult part - after this it was a series of shorter ups and downs, with the exception of one or two steeper climbs, and sharp descents. The sun was shining on us through Derryclare and Binn Choirr and we began falling into the shadow when we hit the aptly named Binn Dhubh (dubh being the Irish for 'black'). From time to time there were gusts of wind as it would funnel up through the valley below. At every turn we were amazed by the beauty of the scenery all around. Brendan was carrying a copy of Rough Guide's 'Walking Ireland' and the estimation there was that this loop could be done in 7.30hours - we were doubting it would take that long! We stopped three times for a bite and a drink - short breaks, no more than ten minutes. Tea does not taste as good anywhere else as it does out in the wilderness like this! The ascent up Binn Bhriain and the descent that followed was both the most enjoyable and the most difficult part of the day - the difficulty being the descent. We reached the end in about 8 hours - so Rough Guide were actually low in their estimation, because we certainly weren't slow and our breaks were brief. On the way down Ben Lettery, making our way to the car, Brendan realised that he had left his keys back in my car! This meant a 4km walk would be added to our journey! It only made the pint in Peacock's that bit sweeter... it being my 18th of the year. Overall, this was a great day, and a heck of an achievement - these being amongst Ireland's most impressive mountain ranges. Fair play to Brendan for suggesting this loop - and spending 9hours in the man's company was entertaining throughout. Back to work on Tuesday - a fully fledged hillwalker now! Also, there is a matter of a 16 mile long run which must be completed tomorrow or Monday. Yikes! 7 miles and turf home. There they are - bags of peat, brought home from the bogs of Fionnán. There is still one or two day's work left to get the rest home, but the bulk of the bog work is done. It was tough, but nice to be out there in this weather. Afterwards, I did my scheduled 7 mile tempo - up the village. The run was: 2 miles easy, 3 miles fast, 2 miles easy. I was surprised at how good I felt, given all the hard labour over the past few days! It was pretty dark by the time I had finished, so 8pm runs are probably not a great idea from now on...I had to ditch the interval training this week, but from now on I should have a clear run at the marathon programme. Hard day on the bog - too tired to run! In the age of instant heat, there is something seriously ancient about a man spending a day on the bog, saving turf for winter fires. But today, that man was me... We spent six solid hours wheeling bags of peat out to the road. It was a beautiful day, with a slight breeze but not a cloud in sight. My father and mother were there too, working hard and having fun at the same time. Around these parts the turf is still cut by hand and saved in the old fashioned way, and a lorry load will see a house through a cold winter. We have an open fire at home and love to light up from October onwards. I brought the camera to catch the bogcotton... a beautiful sight! Of course, after all this hardship, I had to give my scheduled run a miss. We really have to take advantage of the good weather to save the turf - so this could take a few days out of the schedule. 12 miles, and the end of the Louth holiday. Two lovely weeks in Louth have come to an end, so we're back home in Connemara. While poor wifey has to go back to work tomorrow, I still have a week's holiday left (which will be spent working on the bog to bring the turf/peat home!). While Louth was a lovely break, my running programme suffered a small bit. I kept up the long runs but the interval sessions were dropped and the tempo sessions were reduced. Holidays can drag you this way and that so it was difficult to commit to 'personal time'. However, I did get out for a twelve mile run yesterday morning - heading from Stabannan to Louth Village. It was a decent route, six miles straight in one direction and then turning back for home. The scenery was beautiful and the day was clear - but with a slight wind that I had to face into on the way out. Added to the wind on the way out was the ever so slight incline that seemed to run the entire way, with only a slight give here and there. Of course this meant that I had the wind at my back and a slow downhill all the way home! The picture here is of Knockabbey Gardens - a lovely open garden on the grounds of Knockabbey Castle, just outside Louth village. The castle itself dates back to the 13th century, and many of the families that lived there since have added to the wonderful garden. I called in here on Friday and met the owner briefly. It's a lovely place and a great way to knock out an hour or so. Carlingford is one of the most beautiful little towns in all of Ireland. It's where D and I celebrated our marriage two years ago and a place for which we've always had a soft spot. There are many attractive aspects to Carlingford: the lough, the medieval castle, the quirkly little streets... and of course the mountain (ok, hill). I've been determined to walk Slieve Foy for some time but never really got a chance until now - us being on holidays here. I parked beside the Tourist Office and set off past St. Michael's Church, where the tourist office woman assured me there was a path to pull me up! The Foy isn't the biggest of hills (it's certainly not a mountain! ), but it's no joke either. It took me an hour and forty minutes to reach the summit, with some 'mild climbing' at the very top. It is, however, a fantastic walk. Twenty minutes after heading off from the tourist office I was knee deep in peace and quiet, with nothing to be heard except for the odd baa-ing of the sheep, the sound of streams trickling, birds overhead and the ever so slight wind. I'm new to this hill walking lark, but it was fantastic and something I'll definitely do more of. It's also a very good workout - I was sweating like a marathon runner on my way up and needed to stop for a break now and then (this wouldn't happen while running!). The final push up to the summit was straining enough, but reaching the top gives you a great feeling - akin to finishing a good race. The descent is nice, but be careful with your step - I nearly turned my ankle once, which would have meant an awkward journey down. Thank God today was a beautiful, dry day - otherwise my choice of walking shoes were flimsy to say the least (an old pair of asics). I was tempted to add to my pints count for the year after coming down the hill, but a soup in PJ O'Hare's was good enough for me!